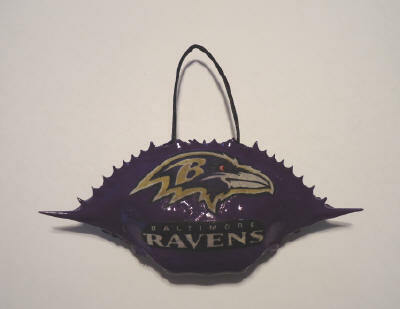 My husband and I made 50 of these Ravens Crab shells for 2012 Christmas gifts for my family and friends who are Raven fans. It was easy to make these ornaments, but it was a process. What’s better then crabs and football?! First, you have to catch, steam, and eat the crabs. This was the yummy part. After eating the crabs, you have to clean the shells, boil the shells for about half an hour to remove all the loose stuff inside, then let them dry completely. This can take a week or more. Spray or brush both inside and out with primer and let dry. Paint the bottom with black paint. Paint the top with purple paint. Using cotton Raven fabric, cut out a Raven head and team name. Use Mod Podge to glue the fabric onto the top of the shell. Let dry. Spray or brush both sides of the shell with polyurethane. This will seal the shell and give the ornament a glossy shine. Thread a piece of black or purple ribbon through the eye holes on the crab shell for hanging.